We’ve just finished another beautiful tiled bathroom project. This bathroom was quite small at 7×5 feet. 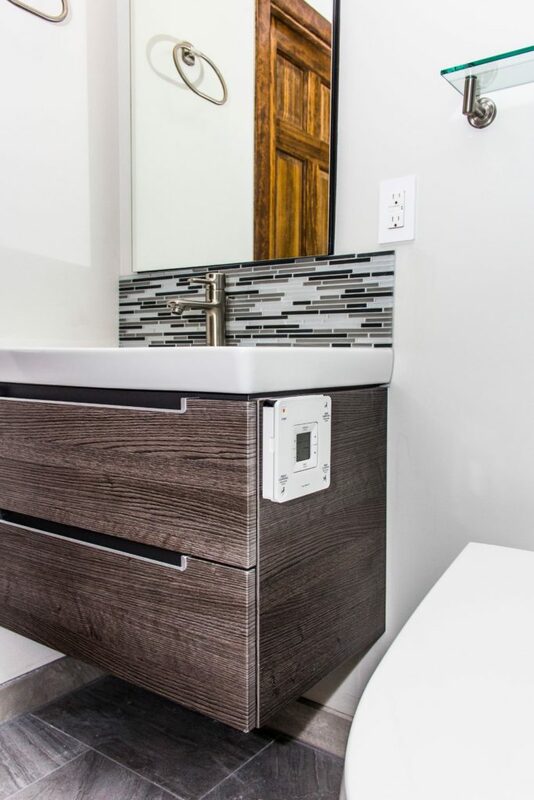 When remodeling a bathroom this small, there are a few techniques that can help open up the room and make it feel bigger. Large tiles make a bathroom feel large. We used 6″x18″ tiles for the shower walls. Using large tiles in a small space is a classic trick to make a space feel larger. 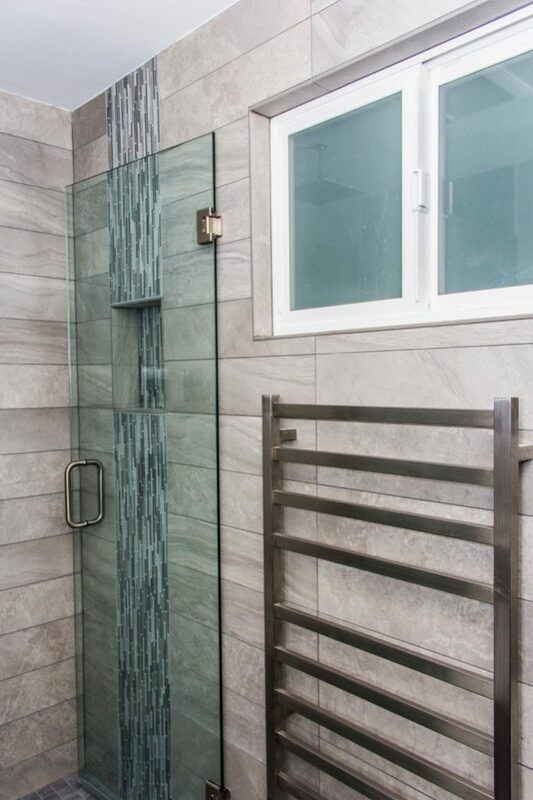 We still use small tiles in a shower because they are necessary when sloping the floor towards the drainage (and you need as much drainage you can get when using a curbless shower). Curbless showers are also great for wheelchair access. The stacked pattern is a good choice for a contemporary look. The tile continues past the edge of the shower and up to the entry door. 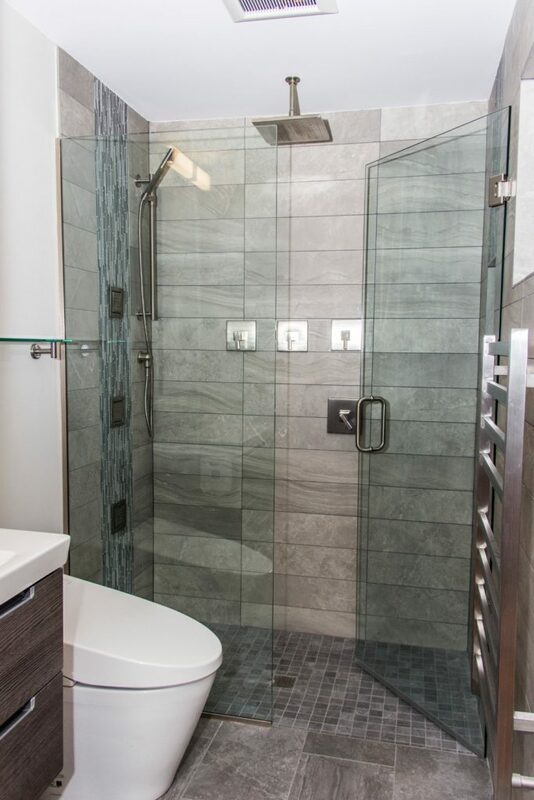 Frameless doors help create a seamless look. By having fewer contrasts to break up the space, the bathroom feels bigger. When you enter the room, it almost feels like you’re walking into the shower. 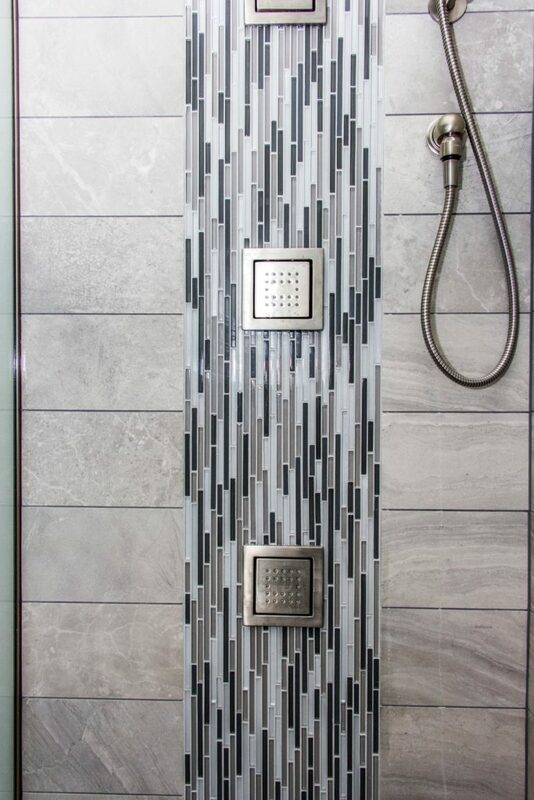 Extending the tile past the end of the shower creates a seamless look. Towel warmers are the ultimate in comfort. Also, If you’ve never tried a towel warmer, you’re missing out. Stepping out of a shower and into a warm towel is a real treat. They’re more energy friendly than you think, keep your towels dry (which prevents bacteria from growing on them) and as an added bonus, the extra heat in the bathroom makes so your mirror doesn’t get foggy after a hot shower. Float the vanity to create an illusion. We installed a new wood-paneled cabinet that is floated to create the illusion of more space. It may not save any physical space, but the extra light passing under the cabinet makes the room feel larger.